We have a four-game slate tonight for both DraftKings and FanDuel. Also, there are several teams in action who are in the playoff hunt, so no rest for them as the season comes to an end. You should be looking at teams in higher over-under games. Vegas and San Jose feel like a high-scoring, high-event game based on Vegas being not rested and San Jose's tendency to play way above their normal pace. There are a few teams playing on the back end of a back-to-back on Sunday. They include Vegas and Vancouver. Naturally, both of them are on the road again on Monday night. Winnipeg and Connor Hellebuyck could be the play on Monday night but watch to see who starts in net for Los Angeles. Remember, when picking around for plays, an over/under of 6.5 dictates offense, but an over/under of 5.5 tilts towards the goalies. In this article, I will be providing you with my daily fantasy hockey lineup picks for DraftKings and FanDuel on 3/18/19. The lineup picks will range from some of the elite players to mid-priced options and value plays. If you have any questions or comments, feel free to hit me up on Twitter @ChrisWasselDFS. Let's get to it, shall we? Hertl's price went down ahead of the game against Vegas which makes sense. He is facing a team that Hertl goes well against though -- Hertl has two points in two meetings. Also, Vegas may not have Marc-Andre Fleury in net again (lower-body injury). Keep an eye out for that one just to make sure. The San Jose center is on his way to his first career 70-point season and is playing over 19 minutes a night of late. Consider Brayden Point in your lineups as a higher-priced secondary option on Monday if one can fit him in. There is some risk because Arizona is normally stingy when it comes to allowing chances and shots. However, before Saturday night's game, Arizona had allowed 30 or more shots in four of five games and nearly 14 high-danger chances per 60. Kucherov has 17 total points in his last ten games and is averaging nearly four shots per game with seven attempts per night. 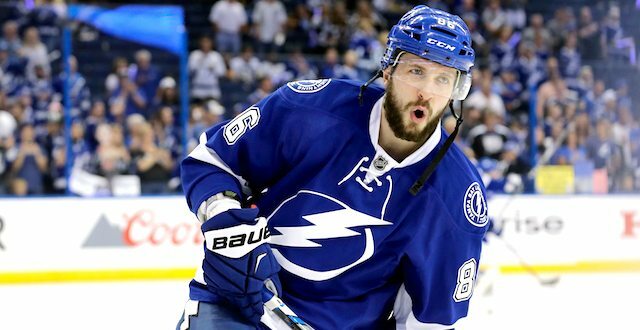 Tampa Bay's power play converts at around 30% at home and Kucherov has a whopping 45 power-play points on the season. It does not matter who he plays against if Kucherov wants to dominate, he will dominate. It's that simple. Patrick Kane and even Mark Stone again have good matchups on Monday night. Pickings are a bit slimmer on Monday night when it comes to defensemen. However, Hedman has points in four straight games and is shooting over three shots per night along with a nice floor overall. Do understand that this is a Tampa Bay team that averages 4.03 goals per game at home and generates the most scoring chances and high-danger chances at home per 60. One of the biggest reasons for that is the play of Hedman. The defenseman carries the puck and holds it in among the best in the game. That creates so many more opportunities for Tampa Bay to tire out its opponent and ultimately score goals. Chchyrun finally is providing some production with two goals and five assists in his last nine games. He had a season-high six shots on goal against Vancouver on Saturday night. The second pairing defenseman asserts himself more and more often into the play as Oliver Ekman-Larsson would. Both Arizona defensemen are underpriced but Chychrun even more so. Tampa Bay will give up their chances and even some goals. Even with Washington out of gas, Tampa Bay managed to give up the third goal to them. Also, note that the young Arizona defenseman has four power-play points in his previous eight contests. Crawford features the best goalie matchup of the night which means, in theory, he should be the highest or second-highest owned on the slate. This depends on how much people feel Andrei Vasilevskiy gives the greatest odds of winning or not. Either way, the Chicago goalie is on fire winning five straight games. This culminated in a 48-save shutout in the hometown of Montreal on Saturday night where he put everyone on notice. Crawford clearly has some gas left in the tank and that is great news for fantasy owners. Furthermore, he is 7-1-1 in his last nine decisions. Vancouver scores a slate low 2.46 goals per game away from home. Besides Vasilevskiy and Crawford, just see who starts for Los Angeles. If it is not Quick, maybe take a GPP flier there.